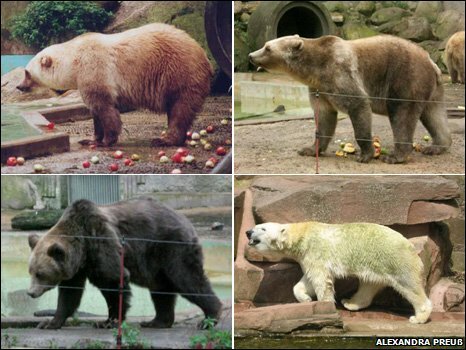 Polar/Grizzly Bear Hybrid: We're Obsessed! Polar/Grizzly Bear Hybrid: We’re Obsessed! How are we just discovering that these exist today? Apparently they’ve been around for quite some time. Deforestation and the melting of our polar ice caps are sending grizzly and polar bears into one another’s territories. The bears are liking the new tail they are tasting apparently, as hybrids have begun appearing in the wild. They were previously thought to have only been possible in captivity, as bears have especially finicky mating rituals. Polar bears and Grizzlies require an extended mating ritual to reproduce, Stirling said. Both live by themselves in large, open habitats. In other words, the mating between the polar bear and grizzly was more than a chance encounter. “That’s what makes it quite interesting,” he added. We’re going to have to side with Grolar Bear on this one. Also worth noting, only Grolars with Grizzly fathers and Polar mothers have been discovered so far. It’s believed that Grizzly females won’t allow the smaller polar males to mount them. Typical. We wouldn’t let short guys mount us either. We admit it. We’re smitten kittens for these beary cool hybrids. Unfortunately, it looks like most of them end up stuffed in the budoirs of eccentric millionaires. Boo! Grrr!!!! Did you know Grolar Bears existed?